Hi everyone, new to the forum but NOT new to MCM and the addiction that goes with. I'm an aging baby boomer, 56 years 'young'. My Mom, Dad and brother are all gone as of 2005, and I found myself in search of things that remind me of better times when we all were together and life was ummmm, 'interesting'. My Dad was the hep one, insisting on sleek Danish modern furniture, and he won for a while. 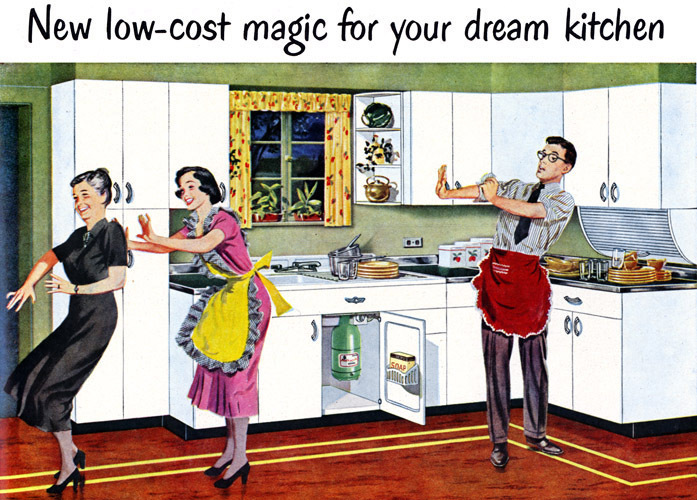 But, much to my dismay Mom won out over the years with Early American style *gak*. Somehow the two styles co-existed in our home. I've gathered quite a few nick-nacks over a few years from there but now that we have a home I'm on the prowl for bigger and better. I have never owned a home in my life, this is my first, and I'm sure it'll be my last. 825sf, basement matches sf. We've not closed yet, and I'm just chomping at the bit for that to happen. My vision it to attempt to take it back to it's heyday - on a modest budget. 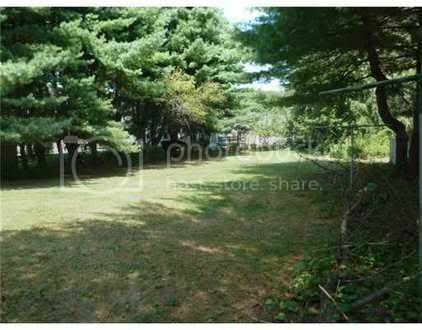 Back yard - SO want to get a vintage croquet set!!! It's a huge yard! 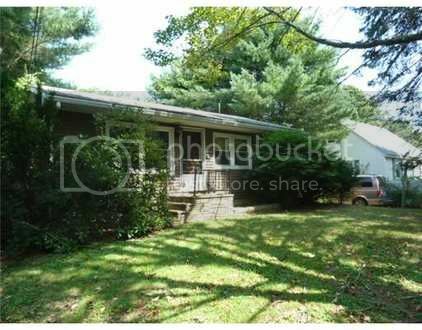 When we first learned we had the house, a few days later I see this on eBay, I was determinded and WON! 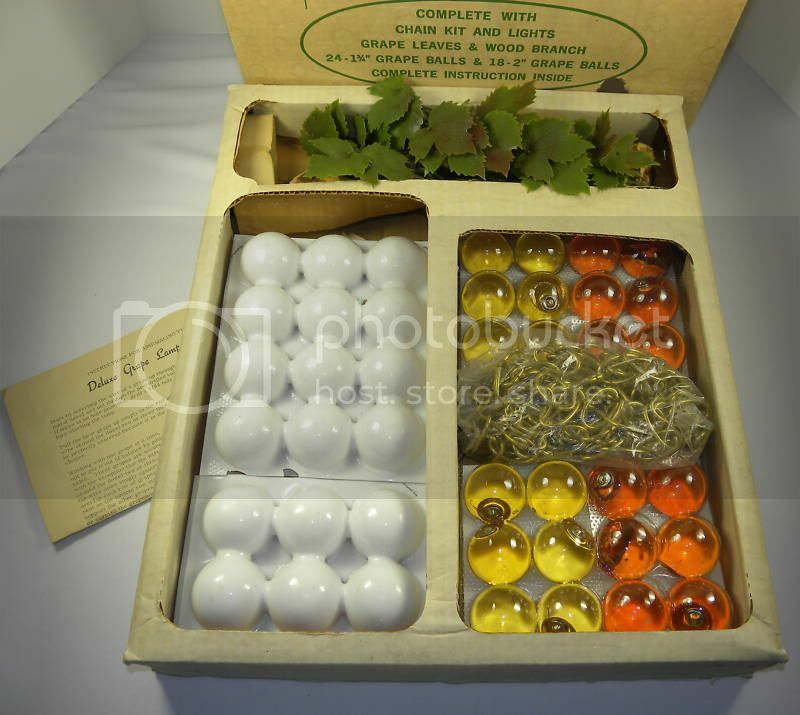 A KIT for making those lucite grape swag lamps - complete with original box. I didn't know those were originally kits - any of you realize this? This, will go in the living room. 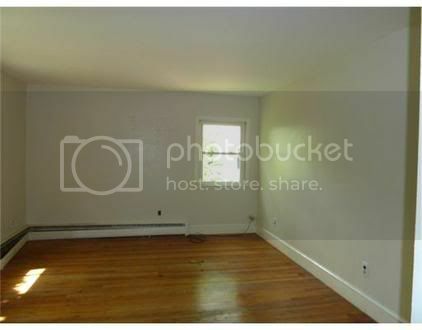 The hardest thing about trying to do my whole house in this style is the fact that I live in Maine. For giggles, I went to Craigslist in San Diego (where I hail from) to compare - and could not believe the offerings of MCM for the most part, at great prices! Ok, question for you all. If my living room is going to be in oranges, can my kitchen cabinets be aqua???? It may not look like it, but at the molecular level I'm actually quite busy. Abso-(bleeping)-lutly! The more colors you have the better! More importantly, if you like it, then it's all good! Look for some old Sunset books, as well as Lady's Home Journal and Better Homes and Garden books, get the ones from the 1950's and early 1960's; stay away from new books, that's only my opinion, but if you stick to the period of your house, you're sure to stay true to the idea of the house! The older books have color pallets that work really well. BTW, orange and aqua are on opposite sides of the color wheel, so if you're working with pastels, they should work great! Great idea! I do have some books, one I just bought at the Goodwill about home decor, and it's from the 70s. Like new. I'll keep an eye out for old copies of those mags. Here's the kitchen. Need to get new flooring (asap! ), and thought to paint the cabinets an off white and the doors Goldenrod, but then thought *AQUA*!! I'm so glad I found this forum. I've been reading a lot while getting ready this morning for work - so much eye candy!! Our kitchen has aqua and orange in it, but our cabinets are birch with a shellac on top. BTW, cute house what I can see of it! 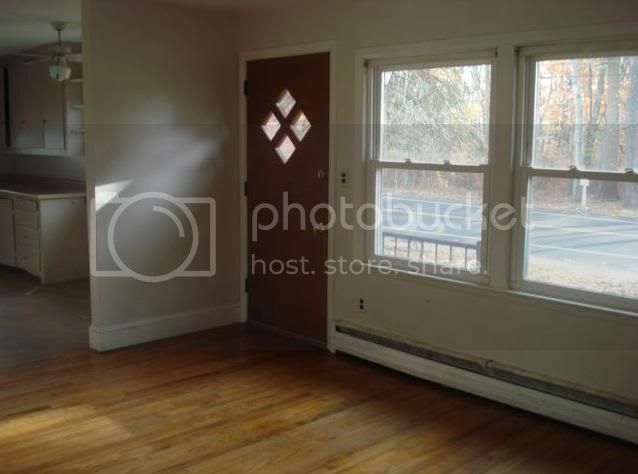 Okay, here's a though... what if... you kept the walls white, and painted the cabinets aqua, and did a checker board of white and orange/apricot on the floor, on a diagonal, of course, and painted your window frame orange to pull it together? If you can find apricot colored tiles I think that would be better, after all, what's apricot but orange and white! Okay, I did a quick search, here ya go! Oh, what does that light fixture look like? That's a pretty nifty idea you have there. 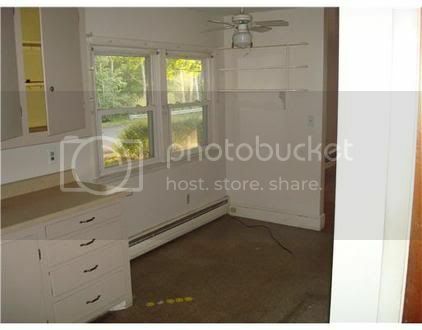 I hadn't considered painting the cabinets AND doors the same color. And what, do the walls in a stark white or? I'd also not thought of a checkerboard effect with two colors of tiles for the floor. That would definitely give the room some 'movement'. I pretty much disdain all the flooring I see at Lowe's and Home Depot - so 80s for the most part. They both carry the one you show by Armstrong, but haven't been completely sold as we've been living with the same thing in cream for 11 years. 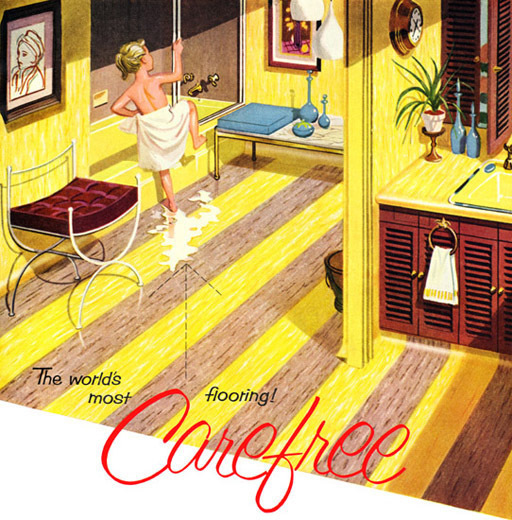 I did find some sites with retro flooring, and while not over the top pricy, add shipping and it's a bit much. But, I think I like your idea better - it comes across more "cheery". Mr. Wonderful will be doing the painting (what he does for a living) and flooring and he's a bit of an 'obstructionist' - so I don't know what angle (no pun intended) I'll have to come at him with to sell the idea of putting in the flooring on an angle. But I do love that idea! With that idea, I could definitely appreciate more, the Armstrong you show. 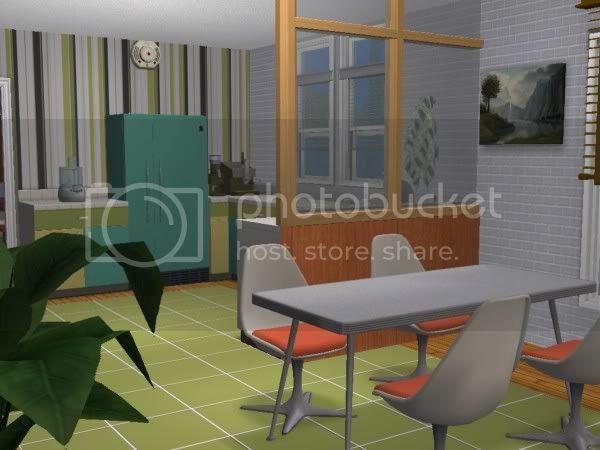 The fixture in the kitchen picture? That's just a run of the mill round globe thing. Nothing "period" to keep. The pic I showed you of the CraigsList purchase is going over the kitchen table, which isn't too awfully far away from that fixture, so I suspect I'll have to put something a bit non-descript there so's not to take away from the star of the show. There's also lighting over the sink, hidden by the cupboard piece. Thank you for all your ideas! 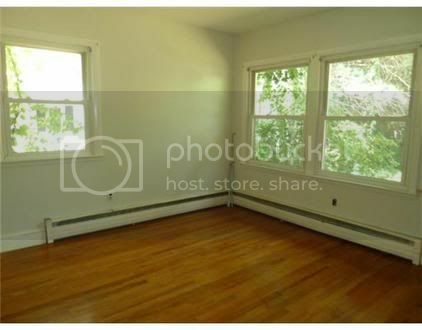 I'm asking for another appt to see the house this weekend, I'll try and take more pics to show the closets and hallway. ETA: a few pics and a question about the kitchen. 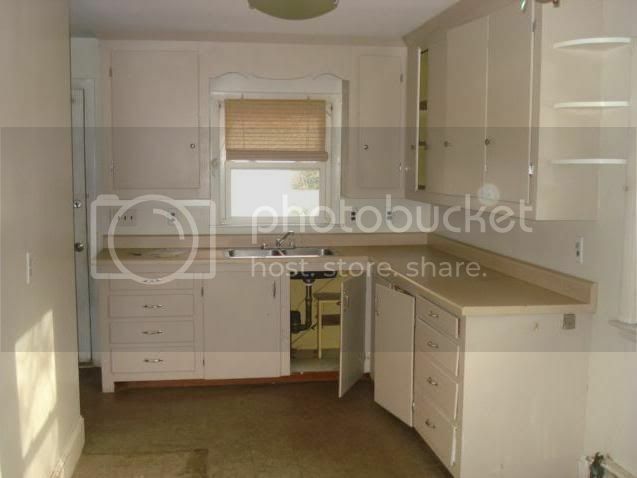 In the first picture of the kitchen, you can see the shelving at the end of the cabinet. In this picture, you can see shelving on the divider wall to the LR. Would I do those in orange, aqua or? 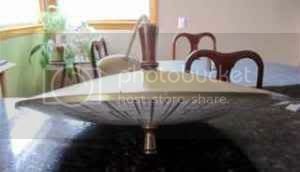 All these pics are off the MLS site and from the appraisal. I'll try to get some of the hallway (ODD 'linen' closet - more like a bookcase! ), and the bedroom closets (double sliding door in both bedrooms). Um, you do know you need a clock over the sink, right? You can run a line from the fixture to power it; that way you don't have to get a cheap quartz clock, but a swell old one. If it were mine, I'd leave the shelving white, or natural wood, but do the sills orange. 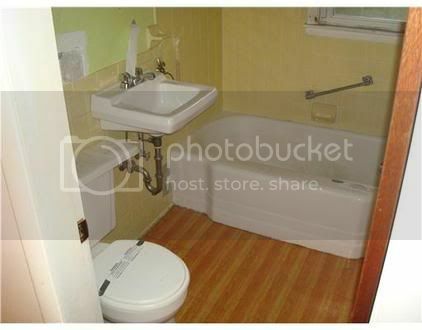 Um, don't scream, but have you ever thought about getting some old 9x9 asbestos tiles for your bathroom? They're not a "health hazard" as long as you aren't grinding them up and snorting the powder, while smoking four packs a day. The asbestos is "in suspension" in the tile, it's the fibers that get in your lungs. I've found tiles on e-bait (ebay) for our old trailer for a good price, and your bathroom is so small, you wouldn't need many. It wouldn't take you long to cover them up if you sold the house! The old tiles look WAAAAAAAY better than the new ones by a long shot. Cute bathroom BTW! It's fun to push old ladies! Are you going to put in drapes? Drapes are so "grown up", as oppose to, cheap temporary, and since you have the cool old double hung windows, you could get some super boss ones, as most of what Gabby and I see don't fit our bigger aluminum windows. Hannah - I had no idea those old lamps were originally kits, though it does make sense now that I think about it. I do have one of the grape lamps--it's green and yellow--that has been in a box for the past few years since I can't find a good place to hang it in my current home. I also have a very similar lucite lamp that's in the shape of a pineapple (similar to the one in the ) as well, that used to belong to my grandparents and is proudly displayed on top of my bar cabinet in my living room. There's something about those babies that I've just always loved, don't know why. Slim - I've got a bunch of old original starburst clocks that have been retrofitted to run on batteries. I bought them already converted, but it's pretty easy (and very cheap) to do the conversion yourself. I like that option since I don't have to muck around with excess electrical cords (or installing new wiring in the wall). Slim - I did a quick search this morning for asbestos vinyl tile flooring and all I could find were two boxes on eBay going for $500 each!!! *faints*. On google all you get are warnings about the hazards of asbestos. I think I'll go with your original idea. Love the print of the wife pushing "Mom" out of the ktichen. Well, DH didn't have any issues with doing the tiles on a diagonal. Yay! When I described your color scheme to him he was fine with it but had to add he didn't want to hear me complaining for years if I didn't like it. lol I can totally visualize it, and I don't think it would be bad to live with! Forgot to mention, we purchased a small (with no 'leaf' for extension) diner table with gray formica on top (that marble effect) and stainless steel edges for $40 at the local flea market. It'll fit in that small space just fine under the double windows there at the end of the counter. I've got some card table chairs (the sort where the legs fold in and the seat then down for temporary use, until I find what I want) I already have a full can of "Pumpkin' paint my boss gave me months back. I think it'll do just find for the windows! I'll mention to Mr. Wonderful about wiring it into the lighting fixture. My dream combo would be the pink, orange and purple lamp...WOW! I did a search on the 'history', but not finding much yet of where they started/originated. Oh, I was thinking about your windows: don't get rid of them! You can have double panes made that will fit into the frames. To get them to work, the frames need to be made deeper, and you can do that easily with a router, maybe 3/8" depending on the thickness of the new glass, that way you can still glaze them! The counter weights will need to be added to as well. I really miss double hung windows, as opposed to the modern aluminum type. Planner Dude, maybe you can view them from my photobucket page. It's a small house, in need of a bit of TLC, but we can see the great potential here. All the photos above are linked to via Photobucket, occasionally there's someone on my gaming forum who cant see pictures posted via photobucket, but that's fairly rare. Wonder what the issue is? Hannah, make sure you visit retrorenovation.com as well. 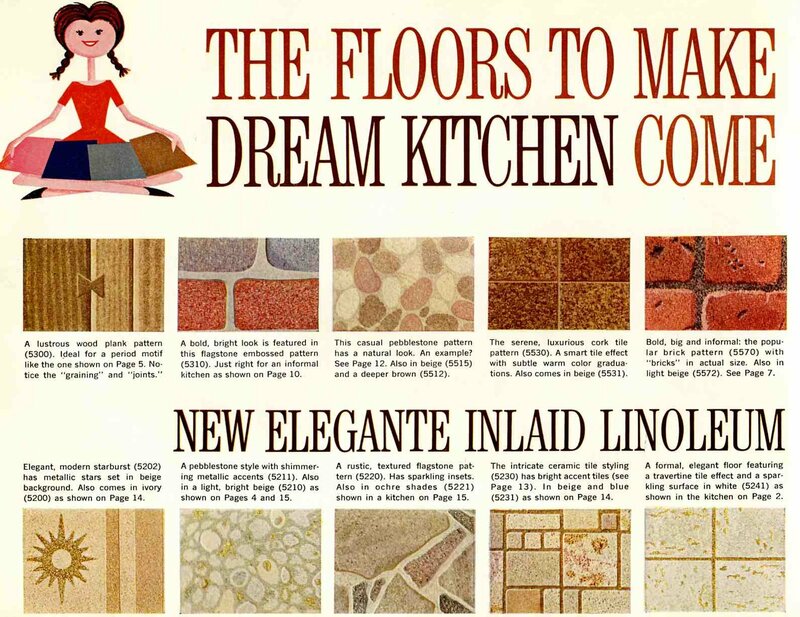 Pam is a FANTASTIC resource for all things midcentury decor! I like your plans so far too! I've stumbled across that site a few times over the years, but I've bookmarked it this time! I spent a good half hour on it this morning before work and didn't want to leave. So, thanks for the reminder. I won't be doing this house in the uber sleek modern style. 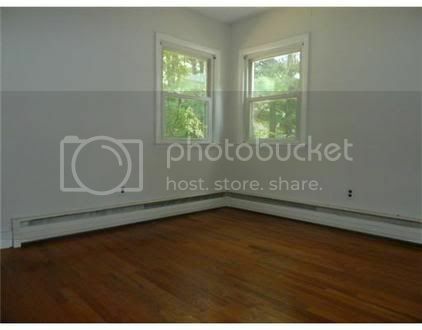 For one, it's out of my price range, and for another reason, I want it to be a bit more 'kitchy'. Not totally Red and Kitty Foreman style (a tad too tacky), but not totally Pinciotti family style either....(which I love the latter VERY much). But, somewhere inbetween. It's my style, and just so happens to be my price range. I'm going to buy this from a person who's selling it on Craigslist tomorrow (this pic however, is off eBay of the EXACT same item selling for MUCH more). I'm getting this piece in near mint from the original owner for $75. On eBay I've seen two recently, this one going for $289, and the second from a seller in Canada asking for $550. It's a 'blanket chest'. 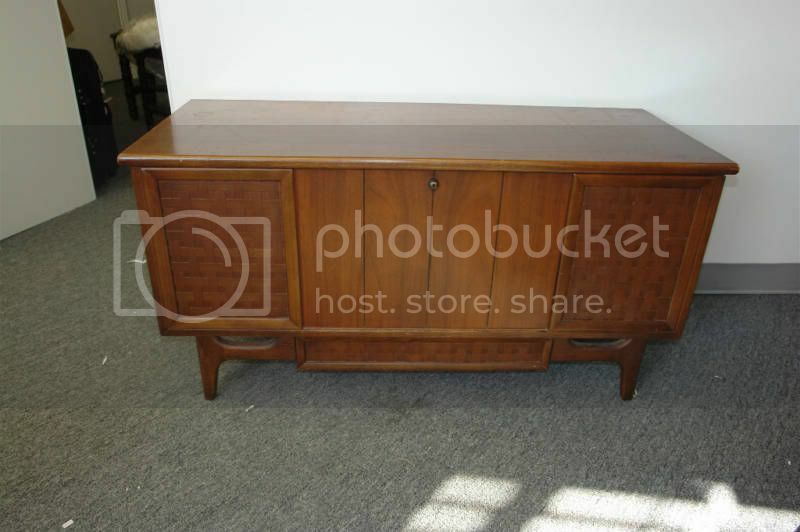 But to me will serve as a credenza in our smallish living room (for the TV probably) but serve as 'functional' to Mr. Wonderful who's all about storage space. Well, it's been 5 months since I signed the original contract on the house. FINALLY, today I got some good news. Our contract expired Feb 6, and we sent an amendment to the contract to the seller a week ago today. Today we hear why we've heard nothing, Wells Fargo did not recieve the extension request/amendment. They contacted their agent and asked for it, and he told them he's sent it twice. Don't know what the communication breakdown is that's going on there, because so far every other contract amendment has moved VERY fast. Just a glitch in the Matrix. Soooooo, I'm thinking - maybe a closing date in the next 2-3 weeks??!! I will try to remember to take pictues as we go along with the renovation and decoration! This, is a HUGE relief!! Baseboard radiators that circulate hot water are not an issue. Electric ones cannot have drapes over them or furniture shoved up against them.